UPDATE: As of Monday, Jeff had not yet deployed. In a message to supporters, Operation Recovery organizers said “Late last night, we learned that Jeff Hanks was not deployed to Afghanistan yesterday as scheduled. Thank you for the hundreds of emails that you sent to his unit commander, Cpt. Ambrosino. His email inbox was flooded over the weekend with 2,000 emails!” But Hanks is still facing deployment or a dishonorable discharge and base officials, citing privacy regulations, refused to comment on his situation. A soldier at Fort Campbell, Kentucky is being forced to return to Afghanistan this week amidst claims he is not fit to deploy because he has not received treatment promised by the Army for severe Post-Traumatic Stress Disorder sustained during his deployments to Iraq and Afghanistan. Jeff Hanks deployed to Afghanistan early last year with the 101st Airborne Division out of Fort Campbell, Kentucky. He returned to the base on leave from Afghanistan this past September, where he sought and was denied treatment on two separate military bases for traumatic injuries sustained in combat. Hanks subsequently refused to redeploy and was forced to go Absent Without Official Leave in order to get medical attention from civilian professionals. Now, less than two months after surrendering himself at Fort Campbell, the Army Specialist awaits imminent redeployment to Afghanistan against his wishes and against the advice of his team of medical professionals. Seeking help in fighting for his right to heal, Hanks contacted Operation Recovery, a joint-campaign of Iraq Veterans Against the War and the Civilian-Soldier Alliance, which seeks to end the re-deployment of traumatized and wounded soldiers. Volunteers from Operation Recovery came to Kentucky to support Hanks throughout November and December as he sought treatment.Yesterday, they hand-delivered an Article 138 notice of wrongdoing to several commanding officers at Fort Campbell and delivered one notice to La Point Medical Center, where Hanks was routinely denied treatment. 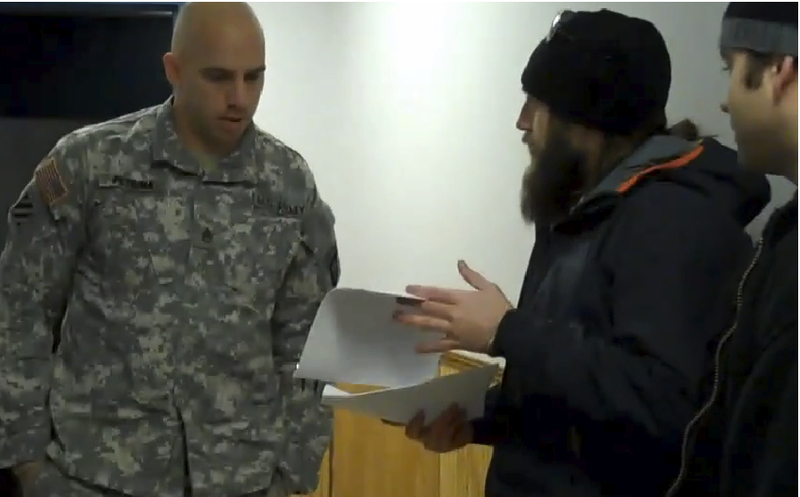 The notice names Captain Jason Ambrosino, the commanding officer responsible for denying Hanks’ right to heal, for violating both soldiers’ rights and military law. The group was attempting to deliver the notice to Ambrosino himself, but he was not on post at the time. In addition to filing the Article 138 complaint demanding that his deployment be delayed, Hanks’ attorney James Branum will also be filing other formal complaints, including one with the Office of the Inspector General and another with offices of U.S. Congressional Representatives. Meanwhile, Operation Recovery supporters across the country sent over 1,500 emails of protest to Captain Ambrosino. “Soldiers have a right to heal from the traumas of war,” the mass email reads, “but you have systematically denied that right in the case of Spc. Hanks. You have interfered with him receiving proper medical treatment, and you appear to be breaking the law by doing so. Commanders had informed Hanks last this week that he was scheduled to redeploy to Afghanistan over the weekend, but as of today he has not deployed. The Army’s mandatory pre-deployment mental health screenings denied Hank’s PTSD claim, contradicting positive diagnoses by three separate civilian therapists, and results of an MRI yesterday that will not be available until after he is in Afghanistan. As increasingly reported by soldiers like Hanks, the Army behavioral health specialist who screened him suggested Hanks seek treatment while deployed in Afghanistan. “These supposed medical professionals are the ones caving into the pressure of the military,” said Jason Chambers, a U.S. Air Force combat veteran from Nashville and a volunteer with Operation Recovery. “They need to know that we are not going to let them get away with it. But Operation Recovery organizers say that Jeff Hanks is not the only Fort Campbell soldier that has contacted them with similar complaints, he is just currently the only one who has gone public with his case. Operation Recovery organizers have suggested that this silence may break soon. These organizers say they will continue to uncover violations of soldiers’ rights at Fort Campbell and to bring to light those in the command structure there who are responsible for the abuses. The Operation Recovery Campaign, launched October 7th, 2010, seeks to stop the redeployment of troops suffering from PTSD, Traumatic Brain Injury, and Military Sexual Trauma. More info on Jeff Hanks and Operation Recovery can be found on the campaign’s website, http://www.ivaw.org/operation-recovery.